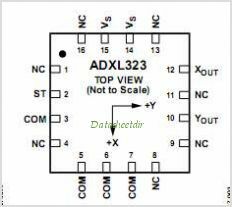 The ADXL323 is a small, thin, low power, complete 2-axis Accelerometer with signal-conditioned voltage outputs, all on a single, monolithic IC. The product measures acceleration with a minimum full-scale range of 3g. It CAN measure the static acceleration of gravity in tilt-sensing applications, as well as dynamic acceleration resulting from motion, shock, or vibration. The user selects the bandwidth of the Accelerometer using the X Y OUT OUT C and C capacitors at the X and Y pins. Bandwidths CAN be selected to suit the application, with a range of 0.5 Hz to 1600 Hz. The ADXL323 is available in a small, low profile, 4 mm 4 mm 1.45 mm, 16-lead, plastic lead frame chip scale packag (LFCSP_LQ). By Analog Devices, Inc. This is one package pinout of ADXL323,If you need more pinouts please download ADXL323's pdf datasheet. 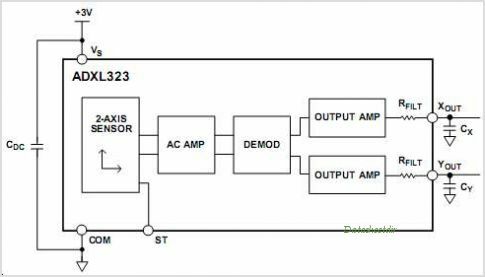 This is one application circuit of ADXL323,If you need more circuits,please download ADXL323's pdf datasheet.